That’s the theme and name of my next carving…”Two Minutes – Fighting”. My little hound painting is coming along nicely so I thought this would be a good time to start the carving portion of my next project. “Two Minutes – Fighting” is inspired by those who find themselves in the penalty box and will feature a pretty rough looking hockey player with an even rougher-than-usual look about him having very recently taken part in his favourite hockey activity. 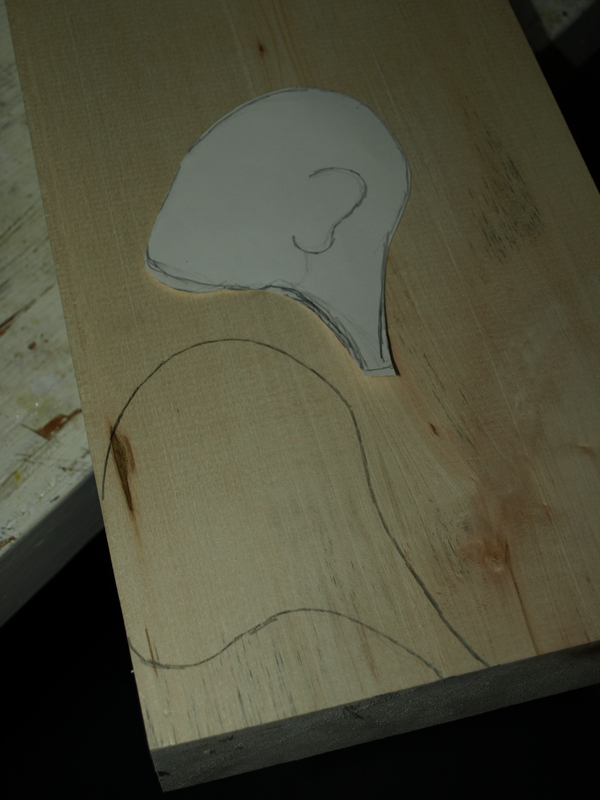 I did a very quick sketch of what I’m shooting for and am starting off with carving the head. 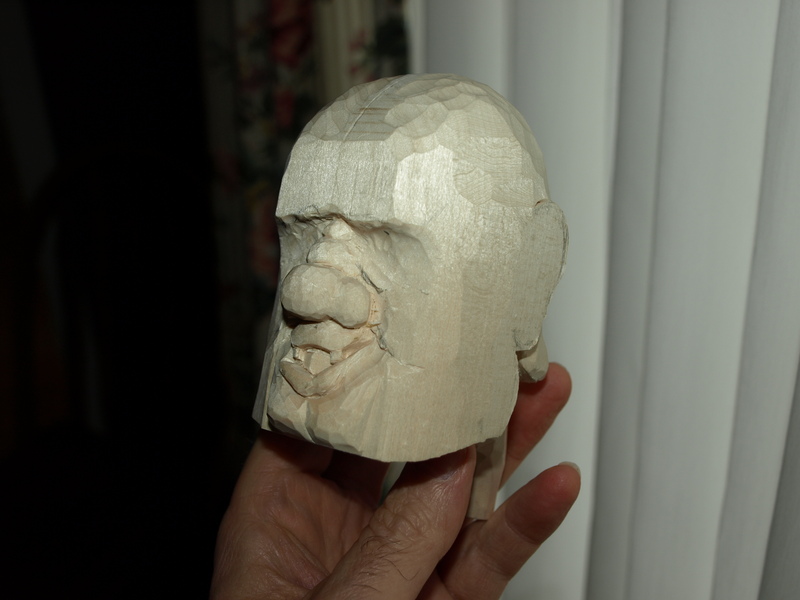 My plan is to have quite a square-jawed character with quite a swollen eye…which is fun, as it’s a bit different from the other faces that I’ve carved. 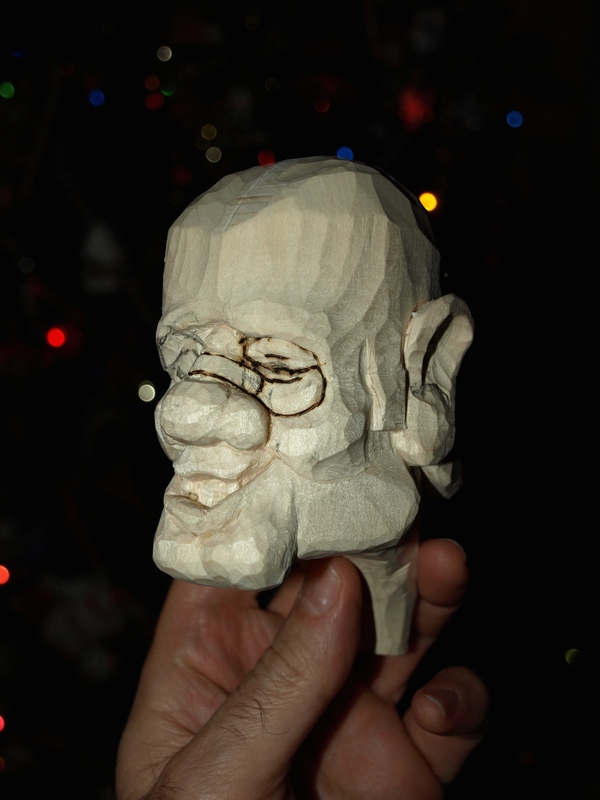 In fact, Peggy often tells me that my carvings could be brothers as they look a bit alike. Well, I’m going to do my best to ensure that this one will not be mistaken as a brother. 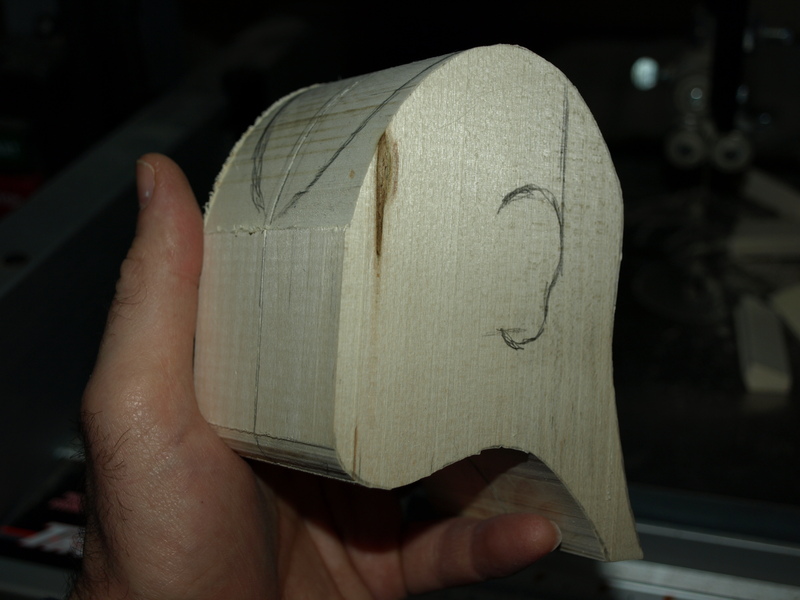 I started in my usual fashion with a basswood blank. I’ve cranked the jaw forward quite a bit and the neck back as my plan is to have him stretching his head beyond his shoulder line as he sits behind the penalty box. I started with his many-times-broken nose and ensured that it was good and crooked. My plan is to carve a piece of white medical tape across the bridge of the nose. You can see the start of that in the last photo. His less than toothy grin just shows that he knows that it’s just a big game and the fights are as important to him as the goals. The cheekbones and jaw line protrude quite a lot right now and you can see some swelling in his left eye and eye-brow. It might get worse. Still lots to do on his facial expression. My plan is to do the helmet separately similar to the way that I’ve done the hats that I’ve carved. I’m looking forward to carving the helmet almost as much as I looked forward to carving the banjo! 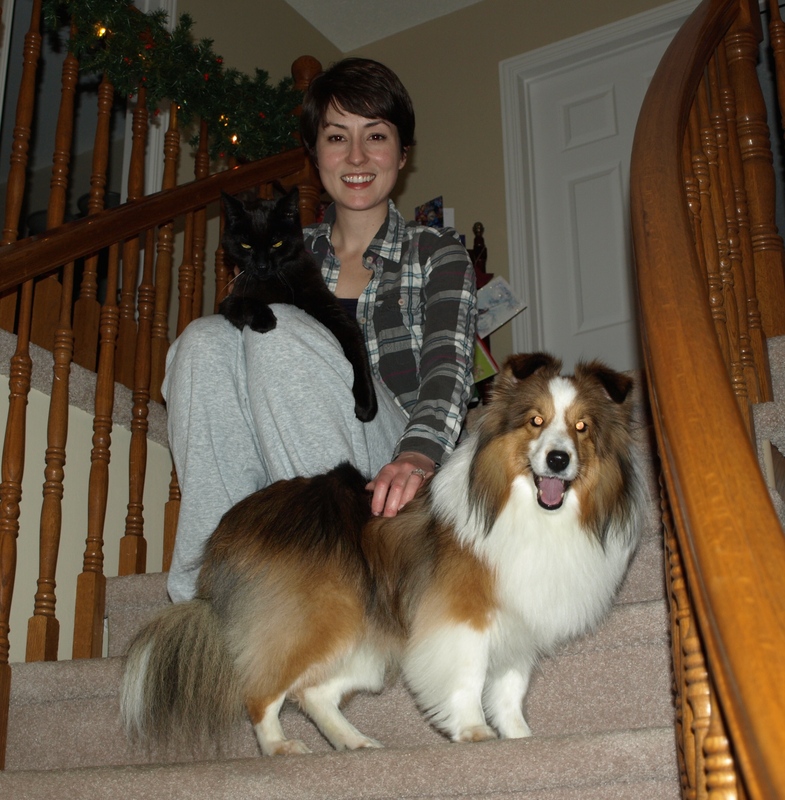 On a more peaceful note, Emily has arrived and our Christmas festivities have started! I can’t wait to see this one take shape! Wishing you and your family a very Merry Christmas! Merry Christmas Lynne, Cheryl and E.C. Have a wonderful time with your friends and family. Mark.